We keep track of the activity in the Zooniverse using Google Analytics. There is a lot to keep up with and Analytics does a very good job. Well we like it anyway. I was looking through the stats today and came across an unusual fact: Leicester, a city here in the UK, is the hardest working place in the Zooniverse. No offense to Leicester, but this shocked me. I’m defining hardest working to mean the most time put into classifying and engaging with the Zooniverse – per user. So in Leicester, users have put in an average of 6.0 hours each since February 2009. There are about 150 Zooniverse users in Leicester and they have put in a whopping 900 hours between them. That is dedication! I’m also assuming that time spent on the site is roughly proportional to time spent actually classifying, merging, etc. I hope so anyway! As you can see, Leicester is miles ahead of the crowd. If you know why this might be, please let me know! 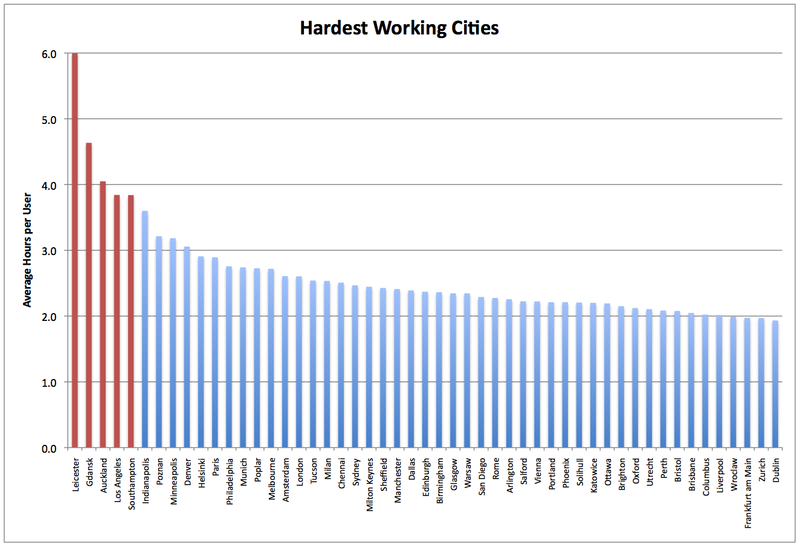 The top 50 cities are shown in the graph below – there are 10,000 in all. It is interesting to note that the chart really levels off for the most part. It then heads into a steady long-tail. This seems to show that the vast majority of users, regardless of geographic location, have put in just under 2 hours each since February 2009. 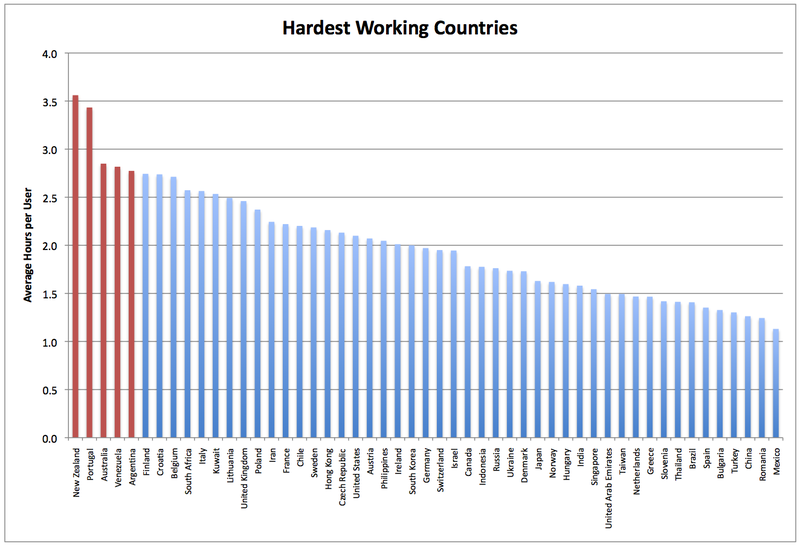 So the natural next step here is to find out which country is hardest working. Apparently it is New Zealand, where Zooniverse users have spent an average of 3.6 hours each working on the site since February 2009. The graph for the Top 50 countries is shown below and reveals the countries where users spend, on average, the most time on the Zooniverse. New Zealand, Portugal and Australia make up the top three. In fact it seems that antipodean users generally spend more time on the site – again, please tell me why. Well that’s my extended coffee break over. If you have specific questions about the stats on the Zooniverse, drop a comment here and we’ll see if we can try and resolve them for you. Have a good week.